First of all, I tried using newest Beta and newest Release. 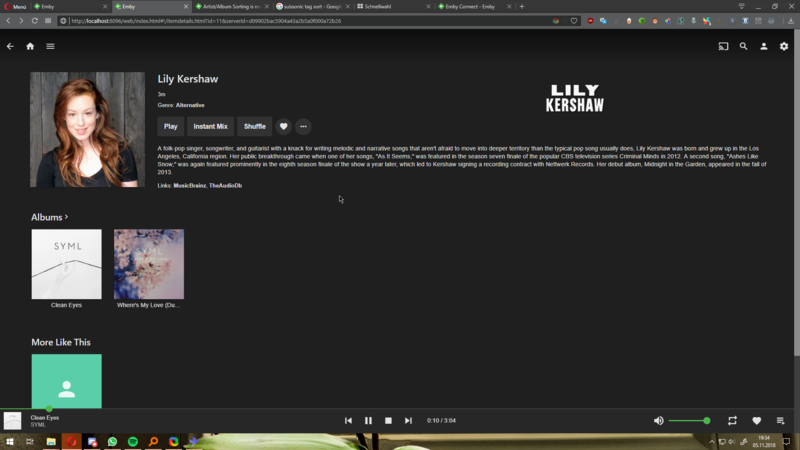 The third song, which I'm playing right now has the Artist tag "SYML; Lily Kershaw". It shows correctly on bottom, so where it shows what I'm playing. 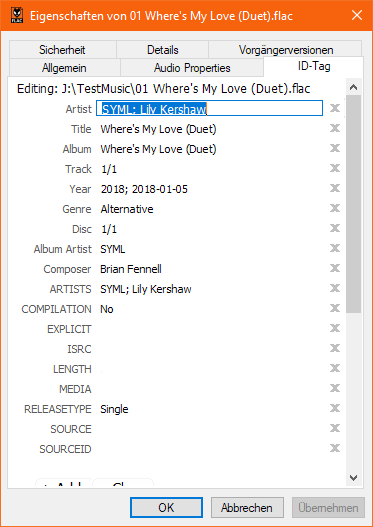 But on the Songs Overview it just shows "SYML". So that's the first problem. I also want to add that you can't open the specific artist Overview from the Artists tab, just from songs. Oh and I tried setting it up multiple times, and the first time I did it with Emby, it wasn't empty. But it put every single song from SYML into a single album, even though they all have different album tags. It is correctly set in the metadata manager btw. 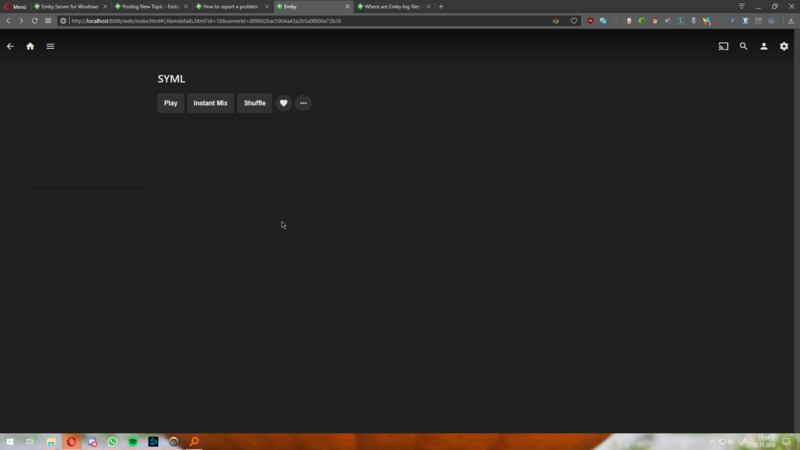 I wanna swich from Plex to Emby because Plex doesn't support multiple Artists, but apparently Emby does. Developers here don't seem to be so ignorant to user feedback like Plex is, so I'm asking here if you could do anything about this problem. I've added the server log file if it helps. Edited by Ookami, 05 November 2018 - 01:15 PM. 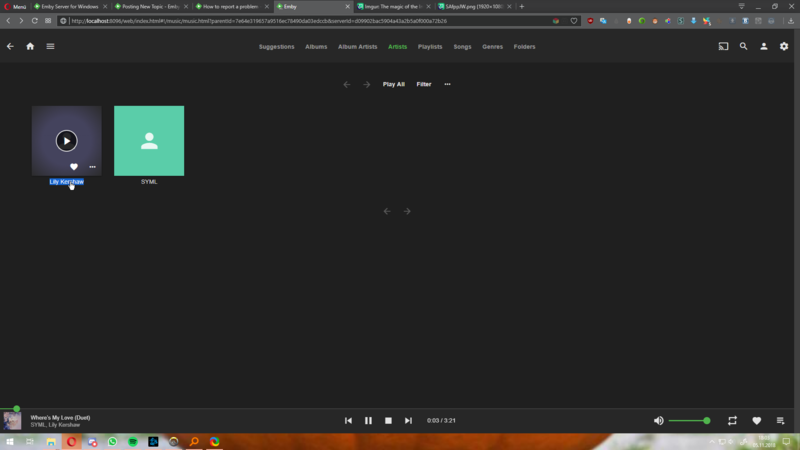 Where is the artist overview supposed to come from? On the songs tab we show album artist, not artist. Ohh okay. Is it possible to change this setting? From the tags. 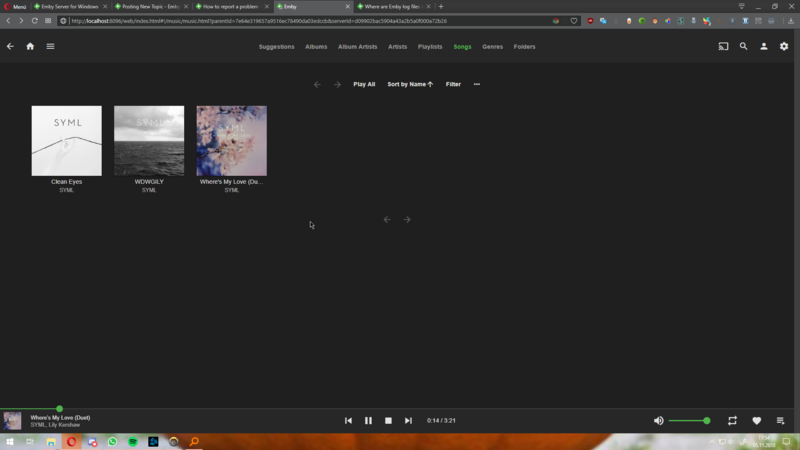 So if I click an artist it should display all the singles / albums with the songs in it, based on tags. Like I thought it scans every file and puts it into the appropiate Artist Overview, based on what the Artist tag is. That's how local players like foobar2000 or AIMP do it, and I think Plex too. Just Plex only supports one artist per song. When you click an artist yes you'll see albums, however you need album folders for this to work. This is a requirement we plan to remove in the future but for now we do require that minimum folder structure. Ohhh okay thanks a lot for your fast help, it works with folders almost perfectly! It's pretty annoying for singles though, I'd have to put them all in a folder now. Well I'm looking forward for the feature that it won't be a recquirement anymore! She has "Clean Eyes" as album. She was inside the album artist tag, but then I removed it and updated the library multiple times. The album should've disappeared, but it didn't. She's not in metadata though anymore. When deleting the library and creating it again it worked though. Is there a problem with rescanning right now? Edited by Ookami, 05 November 2018 - 02:38 PM. The presence of the album is currently based on folders and is not yet 100% tag driven, so that is most likely why it is still there. It is the last thing left that we need to do in order to become fully tag driven. Thanks !